OK so i've been learning about turbos and turbo air flow maps (to help me understand about turbo) and i understand turbos can get compression surge from getting to much back pressure say without a wastegate or what ever, and thats pretty easy to understand as the pressure build up can slow down the turbine. And now I learnt that turbos can get surge from lack of pressure from what i think i've learnt, according to these air flow maps? or am i reading them wrong? ^^^^this turbo on a small displacement engine. I know that most times if its only a bit off to the left of the surge area you get lag, but I've told (or i've read) this is bad for the turbo if your too much into the surge area? whys that? and how does it damage the turbo from lack of pressure? Go back to basics. If you have a eng of X displacement and you where feeding it a set amount of fuel Y to produce a given hp Z . Now if you increase the volume of fuel , say going from 3/8 fuel line to 1/2, if X remains constant the eguation goes out of balance. 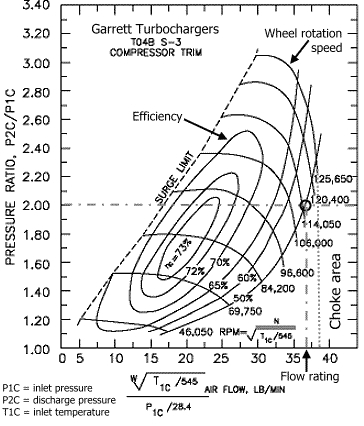 X+(y)?= Z where increases of Y cannot produce an incease of Z .Which is equiviant to to much turbo flow. Now go the other way. Increase X without a corresponding increase of Y . Z= (X)?+Y , Z cannot inrease do to the imbalance of the formula. This time its the equiviant of too little turbo low for the demand . I hope this answers your question. Still a bit lost... how does the turbo actually get damaged? Only from over pressure , which the waste gate prevents. RT; Couldn't have said it better, myself. Ouch. My head hurts.